CCleaner for Windows 7 - A program that allows you to clean your computer from obsolete files and tidy up the registry. The utility detects unused data, temporary storage cache files, constantly scans browser add-ons, analyzes logical drives, finds duplicates. The software allows you to create backup copies, organize your Start menu, fix ActiveX errors, and fix invalid file extensions. 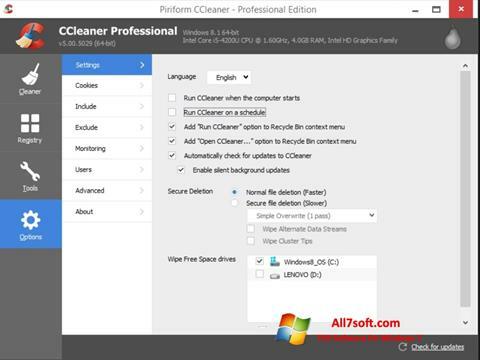 You can free download CCleaner official latest version for Windows 7 in English.